There are probably no two wintertime trout spots on Florida’s Big Bend more famous than Dan May and Barnett creeks, south of the Suwannee River. These are not piddling little ditches draining small patches of coastline, but big creeks that rival some of Florida rivers in overall size and tidal flow. January‘s deepening winter usually brings Gulf water temperatures well into the fifties. Spotted sea trout of all sizes are attracted to these creeks’ deep holes and channels, which hold just a few degrees more warmth than the surrounding shallows. Water is a pretty good insulator, and adding a few days of solar radiation to a dark mud bottom or oyster bar can create just the warmish hideout trout need to survive. Survive the elements, that is—not necessarily the anglers who make their annual sea trout pilgrimage to Suwannee. The combination of cold weather and coastal creeks means big spotted seatrout! Both creeks are just a short boat ride from either of Suwannee’s marinas– Miller’s Marina ((352) 542-7349) and Suwannee Marina ((352) 542-9159) have fuel, live bait, tackle and good launching ramps. On exiting either marina’s access canal, travel upriver approximately a mile-and-a-half to the confluence of the main river and East Pass, which runs south, emptying into the Gulf towards the Cedar Keys. From there, and on any tide, you’re safe to run to the mouth of Dan May Creek, at approximately N29 16.647 W83 06.580, on your left. The entrance to Barnett Creek is around the corner, about a mile farther south, and a bit more difficult to approach, especially during an extreme wintertime low tide. Don’t expect to get your bay boat out of East Pass on super-low water, but as the tide rises, motoring slowly close to the shoreline will keep you off the mud bars that cross Barnett’s entrance. Dan May and Barnett creeks are typical in terms of their structure to creeks and small rivers elsewhere on the Big Bend, as each has numerous winding turns, oyster bars and deep holes. All of these structural features attract sea trout. Bars, usually dark, soak up sunlight and warm up during the lower tides. As a result of that warming, baitfish hide atop them on higher tides and the cycle of predation begins—trout prey on baitfish; we anglers prey on trout. Conversely, on lower water, radiant heat is held in deep holes (usually no deeper than 8-feet here), attracting bait, and then trout. Winding turns allow the tide to do its job of washing out holes and providing slow flowing eddies in which oysters grow and little critters hide. Fishing these big creeks involves patience and some fishing etiquette on the part of fishermen. On any day, especially weekends, expect crowds. Before this fishery became widely known outside of Dixie and Levy Counties, anglers typically began their day searching for fish by trolling the creeks with deep-running plugs, mostly brightly colored MirrOlure TT’s. When slow trolling produced a strike (And usually a fish on any of the 3 treble hooks for which MirrOlures are famous. ), it was a simple matter to stop, and continue fishing by casting about the area. I’ve always been surprised that a trout will strike a plug towed from a boat that was just five or six feet overhead, likely proof that cold water slows the reactions of many fish species. These days, with sometimes dozens of boats in the creeks, trolling can be difficult, and tempers can flare over the prospect of crossed lines. If you arrive on a slow day, give trolling a try, but otherwise remember to honor your neighbor and anchor up. I don’t think the trout are necessarily locked up and holding tight in any particular parts of these creeks, especially on sunny days. They move with the tide looking for comfort and food, and many anglers have great success staying in one spot and tossing live shrimp (rigged on a light jig head) or the above-mentioned MirrOlures. If you can find a spot on the deep spot of a bar or in the mouth of a side creek, try that. Otherwise drift the middle of the creek. And remember, the colder the day, the more attention you need to give to keeping your bait moving as slowly as possible. Over the past few years, there’s been a trend away from the heavier baitcasting outfits traditionally used by many Big Bend inshore fishermen towards smaller and lighter spinning gear. These creeks are the perfect place to use spin tackle, as few of the fish are ‘gators’ and likely to need ‘horsing’ to the boat. Smaller reels spooled with 10-pound test braided line are adequate, and many times helpful in feeling the lighter bite of these cold-water fish. 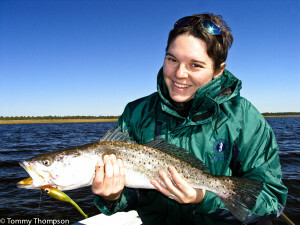 Barnett and Dan May creeks are by no means the only places to catch a limit of wintertime sea trout on the Big Bend, as there are literally hundreds of similar creeks from Chassahowitzka to Steinhatchee. However, they are convenient to reach, easy to learn, predictable in that they almost always hold fish and well-protected from the elements. And that’s a good thing when the wind’s howling from the northwest and it’s 30-degrees outside!